يقع فندق منتجع ترافل لودج ميرامبينا داروين، المصمم ليناسب كل الضيوف سواء كانوا من رجال الأعمال أو السياح، في مكان ممتاز في أحد أكثر المناطق تفضيلاً في دارون سيتي. يسهل الوصول إلى هذا الفندق ذو 4 نجوم من المطار، فهو يبعد عنه مسافة 12 km فقط. يشكل هذا الفندق ملاذاَ مريحاً للاسترخاء ويمنح زواره فرصة للاستجمام والتجدد، وهو يقع على بعد خطوات من المعالم السياحية الكثيرة للمدينة كمثل: Viva La Body, ‪St Mary Star of the Sea Catholic Cathedral‬, Read Back Book Exchange. استمتع بالخدمات الراقية والضيافة التي لا مثيل لها بهذا الفندق في داروين. هذه بعض الخدمات الموجودة في هذا الفندق: واي فاي مجاني في جميع الغرف, مكتب الاستقبال على مدار الساعة, مرافق مخصصة لذوي الاحتياجات الخاصة, تخزين الأمتعة, واي فاي في المناطق العامة. في منتجع ترافل لودج ميرامبينا داروين غرف نوم يزيد عددها عن 224 صممت بذوق وعناية لتوفر لك كل وسائل الراحة . بعضها يحتوي أضاً على غرفة معيشة منفصلة, تلفزيون بشاشة مسطحة, اتصال لاسلكي بشبكة الإنترنت (مجاني), غرف لغير المدخنين, مكيف هواء. يقدم الفندق العديد من الفرص للاستجمام كمثل مركز للياقة البدنية, حمام سباحة خارجي, سبا, مسبح (للأطفال), حديقة. يشكل منتجع ترافل لودج ميرامبينا داروين بخدماته الراقية وموقعه الممتاز، قاعدة مثالية للاستمتاع بإقامتك في داروين. It's the perfect hotel. 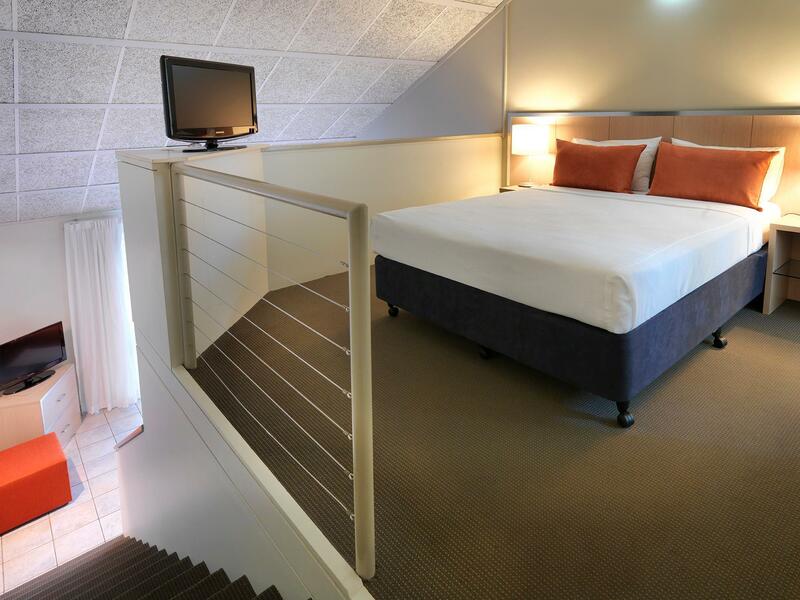 The rooms are modern, spacious, clean and comfortable. It has really nice swimming pools with bar. It's very nice when you get complimentary drinks. 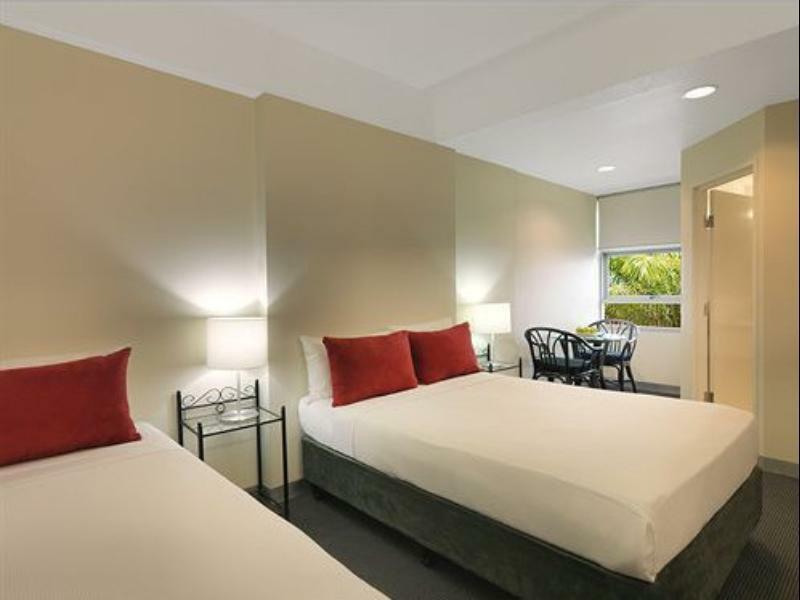 The hotel is also close to the city, the supermarket and the bus to Casuarina Shopping Centre. I always enjoy staying there. For the price you pay the rooms are quite reasonable all though quite dated. The bathrooms are in need of renovation and plumbing upgrades. The pool and bar facilities are quite nice and relaxing. Great location right next to woolworths and a short 5 minute walk from Mitchell street. As anyone to travels to Darwin knows, planes get into Darwin at terrible times! We live a 12 hour drive from Darwin, so we need a hotel to rest up as every flight travels overnight and arrives at 4-6am. Hotels will not let you check in at 5am, not unless you pay for two nights. We went on a whim to the travelodge and we got a room at 5am for under $100, and only had to pay an extra $40 for early check in. In the past we have paid anywhere from $60-$130 for this. The guy at the front desk was really nice, quick and accommodating. The rooms are very basic, but to tell you the truth I was just happy for a place to put my head down. The location is great, not on the main drag, but right across the street from Coles, there is a pool and restaurant should you need it as well. There was 3 of us staying in a room with 2 double beds comfortably. Almost everything was good for the price except the shower somehow did not have hot water for the first 2 days but it was fine the next few days. Also, the toilet somehow becomes smelly after flushing - I think it has something to do with the plumbing. Housekeeping kept taking away our towels and replacing it with two although we booked the room for 3 people but this was easily fixed when we informed the reception. The housekeeping and staff are all very friendly and very helpful. The hotel is not directly in the city centre but along the CBD and just a short 5 min walk from the bars / pubs / massages / food (basically the city centre). Very good location as you will not be disturbed by noise of the crowds in the city but equally super easy to walk to the city :) Everything else was excellent. Stayed in a 2 double room which was nice. Comfy beds, enough space. Bathroom could use a little upgrade. Good restaurant, nice art gallery. I find it a good first stop if driving from Darwin to explore the park. Supermarket across the road (quite expensive). We booked this last minute and wasn't disappointed. Location was great and served its purpose for one night. We didn't get to use the facilities so difficult for me to review these. All in all a good price and decent nights sleep. The newly renovated room at the back was large enough for our family. We enjoyed the pools so much. Close to Woolworths and tourist attractions such as Smith Street mall and Waterfront. Staff were friendly and accommodating. Noise in the corridor at midnight- maybe reminder in the corridor to give consideration for people who's already asleep. ants in our room and AC not properly working but other than that, all good. maybe a need to wash curtains as well as its dirty already. Comfortable place with parking. I always have a good stay at this hotel, the townhouse are quite large and the hotel is positioned close to town! I recommend for the business traveller or just someone looking for easy acess to Mitchell street or town! the hotel is idealy placed as it is close to the centre of the city and night life but far enough away not to be noisy. 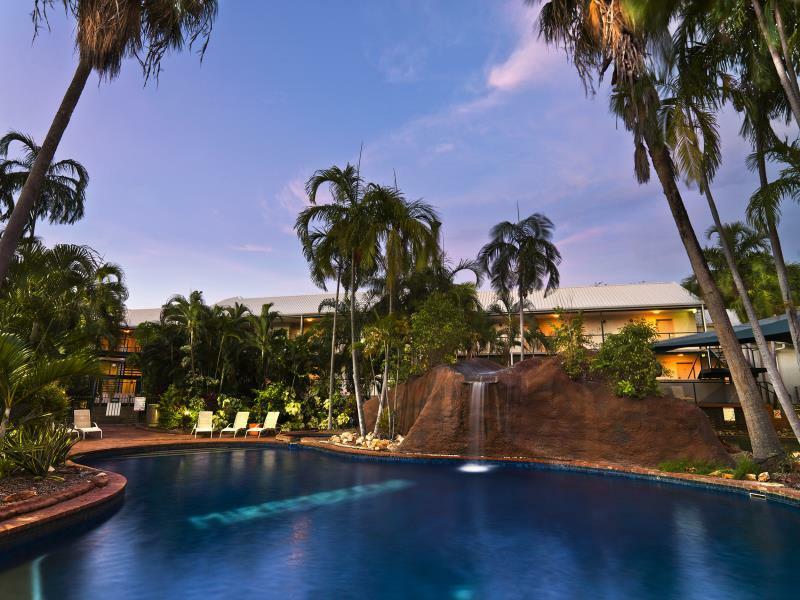 this is a really nice place to stay in Darwin! the rooms are central, large and clean with a large bedroom upstairs and lounge and kitchen downstairs! this place is great value for money and I would recommend this place to anyone as good lodgings! I will be staying at this place again! The stay was excellent, though it was really only a 12 hour stopover between flights. 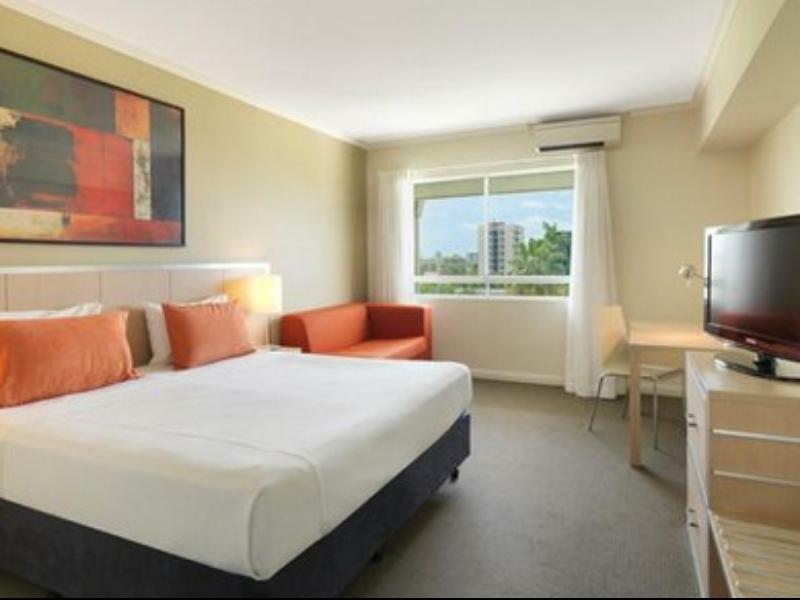 The hotel is well located in the centre of Darwin, so there is a great choice of pubs, restaurants and take-away options nearby. The room was very comfortable and spacious. The staff were helpful - check in and check out were quite speedy. The hotel is well laid out around a central courtyard with two pools. There is a fitness centre and business centre, though we didn't use them. The internet cafe is conveniently located on the ground floor near the lifts. Unfortunately the computers were a little slow and probably due for replacement soon. we enjoyed our stay, it was unfortunately a very busy weekend and we couldn't get lounge chairs or towels at the pool. the room was clean, comfortable and quiet. very convenient to downtown restaurants, stores, and the waterfront. the room was exactly as it was advertised, clean, comfortable, quiet. the location was perfect, not right downtown but a couple of blocks away so i couldn't hear the traffic, but it was an easy walk to get to everything. lots to do if you wanted or just a great place to relax. Stayed for the one night and came across this room at a decent price. 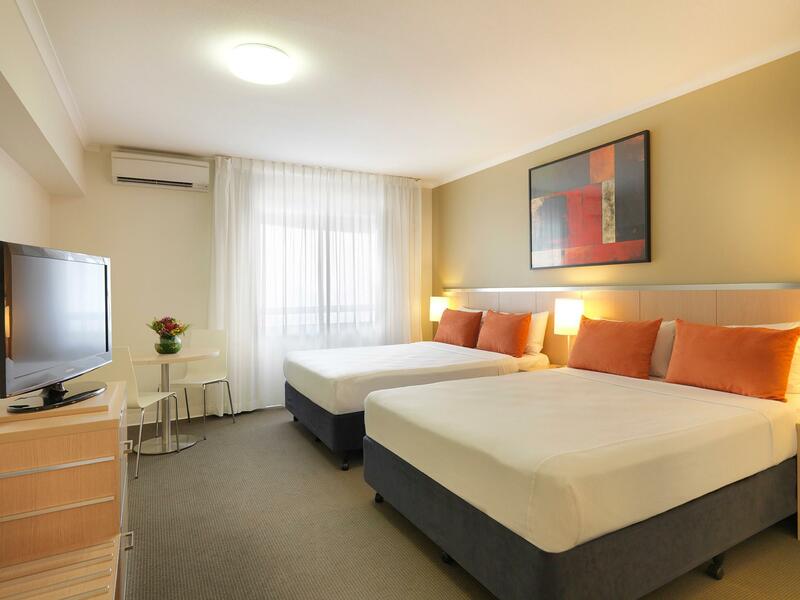 It's a good value hotel within close walking distance to everything in town. Woolworths supermarket is just across the street which we found to be handy. Plenty of parking at the hotel and great outdoor pool area. Staff are helpful and courteous, no complaints. Room is fine if you're not fussed on luxuries as we are. We're only in there to sleep in at night, so it's a good price for what you are getting. 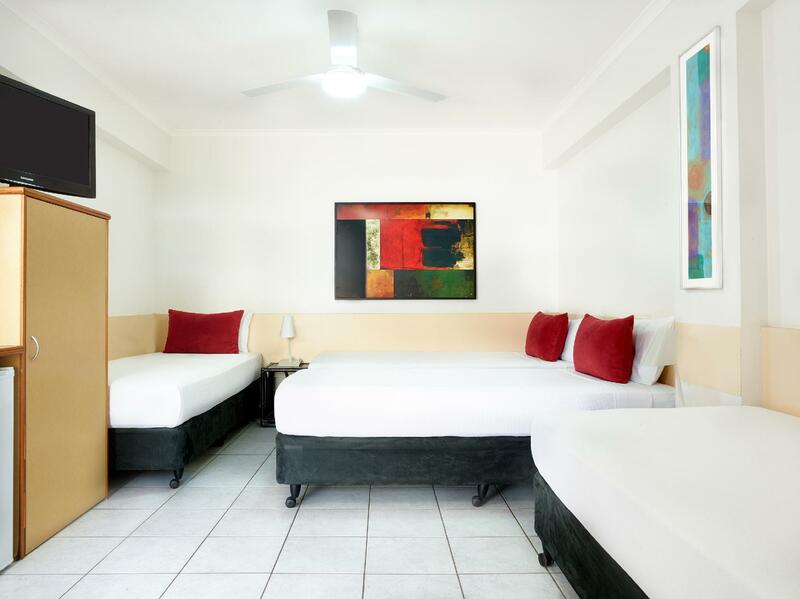 this was our first stay at the mirambeena travelodge, and it won't be our last if we decide to travel in darwin again. the facilities were fine for our needs, clean rooms, swimming pool and the staff went out of there way to ensure our stay was enjoyable. i would defininitely recommend to anyone who has business or transits with family.